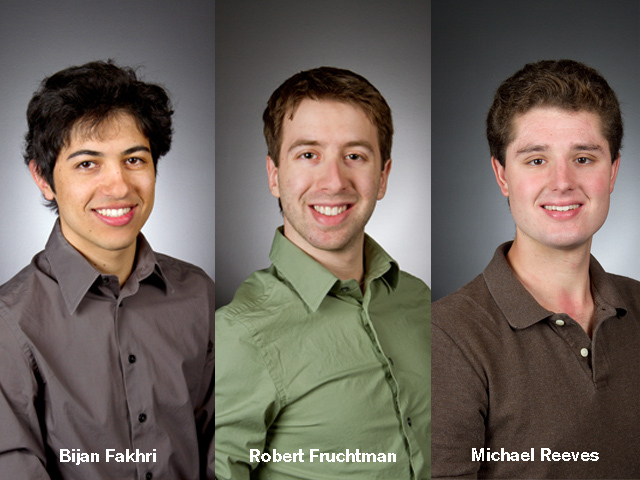 A recent Arizona State University engineering graduate and three current engineering students spent the past summer as interns at one of the United States’ most prominent national research centers. 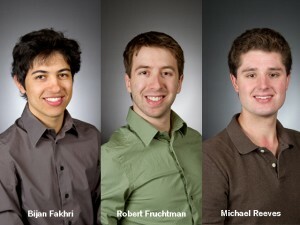 Robert Fruchtman, Michael Reeves, Dominic Chen and Bijan Fakhri worked for three months for the Sandia National Laboratories facility in Albuquerque, N.M. The U.S. Department of Energy laboratories (including a facility in California) focus on national defense projects applying science and engineering to support homeland security, counterterrorism and military operations, as well as security-related energy and climate research. Fruchtman graduated from ASU in May after majoring in computer science in the School of Computing, Informatics, and Decision Systems Engineering, one of ASU’s Ira A. Fulton Schools of Engineering. He was also a student in ASU’s Barrett, The Honors College. He’s now pursuing a master’s degree in computer science at Purdue University. At Sandia, the graduate of University High School in Tucson had opportunities to apply his education by assisting in projects involving technology used to process and analyze data provided by satellite observations. Reeves, a graduate of Mountain View High School in Mesa and now a senior majoring in computer systems engineering with a minor in mathematics, also helped on satellite technology projects. In addition, he worked on developing prototypes for improved computer software for use in a variety of security and defense operations. “It was a great opportunity to apply what you’re learning in classes, and you learn a lot of new things,” he says. Reeves plans to apply to do an internship at Sandia again next summer. Junior computer systems engineering major Fakhri and Chen, a junior majoring in computer science and mathematics – both Barrett honors students – worked in Sandia’s Center for Cyber Defenders. Fakhri, a graduate of Horizon High School in Ahwatukee, assisted on projects to develop unclonable silicon wafers and speed up the performance of software-defined radio communications systems using digital signal processors. Chen, a graduate of Desert Vista High School in Ahwatukee, helped with designing a system debugger for the Android smartphone platform, and piloting a Department of Homeland Security competition to develop secure voting machines. He expects some of what he learned at Sandia to be useful in his student researcher role with ASU’s Center for Cognitive Ubiquitous Computing (CUbiC), which focuses on design of devices to assist people living with perceptual or cognitive challenges. Fakhri is helping develop wireless devices to help stroke survivors regain motor control. Chen will apply his Sandia experience to his work at ASU assisting faculty members with research in computer security and development of a mini-submersible device for exploring a lake in Antarctica.